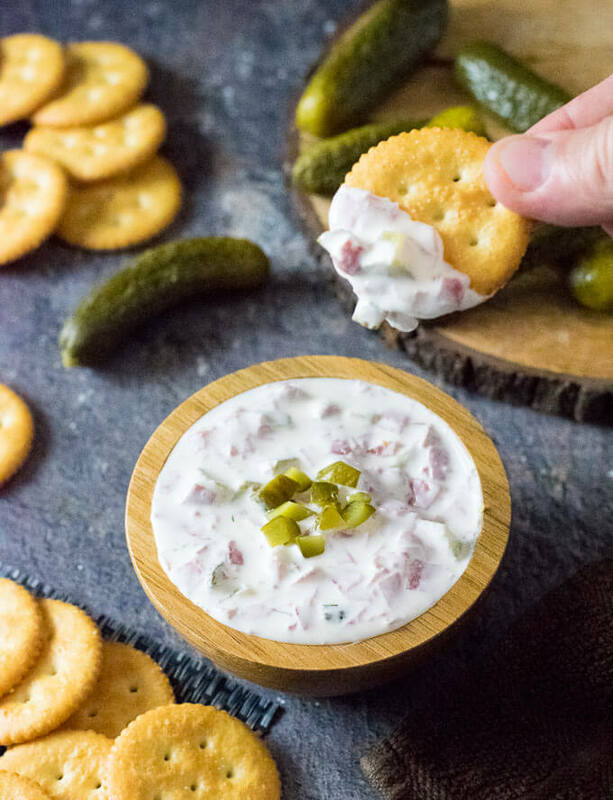 Pickle wrap dip is an effortless appetizer fashioned after the popular party snack featuring cream cheese and deli meat wrapped pickles. 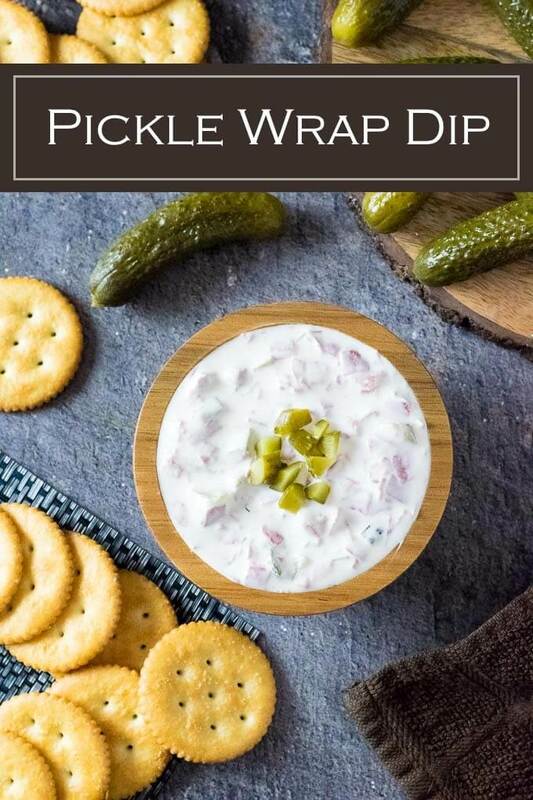 Pickle wrap dip features a blend of cream cheese and sour cream as a base, with chopped pickles and deli meat mixed in with pickle juice and seasonings for added flavor. 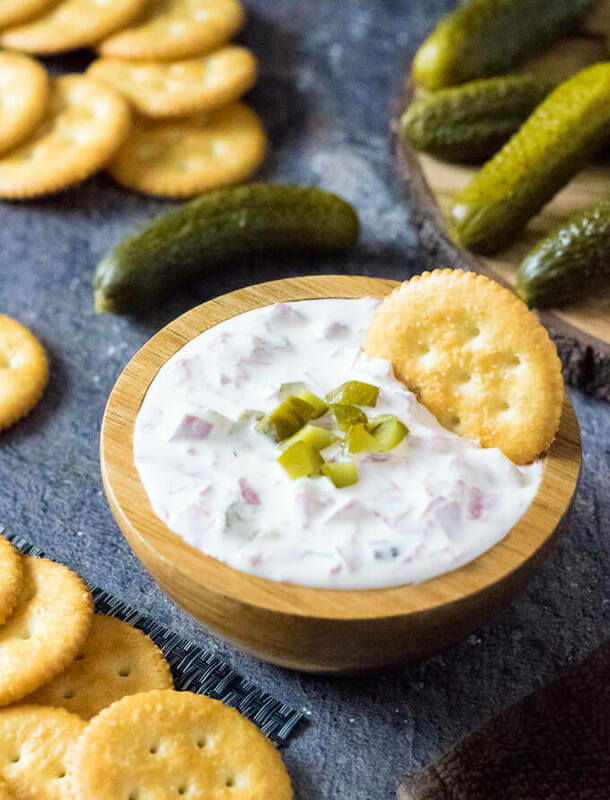 This easy dip tastes just like the popular wrapped pickles party appetizer, but is much easier to prepare. The pickles and the deli meat are the star of the show in this recipe. 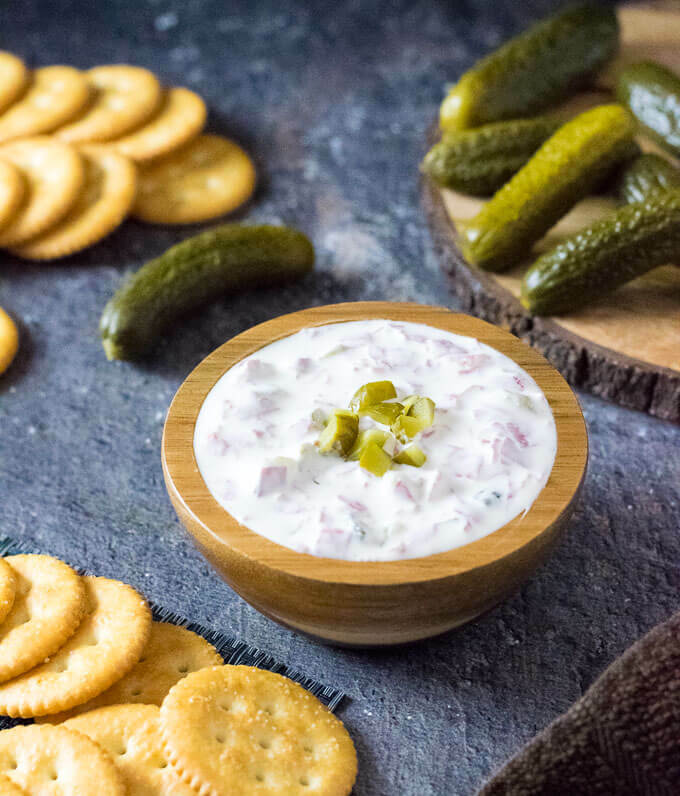 I recommend using baby dill pickles because they are firmer and have more surface area, which adds better texture to your dip. I use chopped Buddig Beef to mix into the dip, however, there is no reason you cannot substitute deli ham instead if you wish. Either would work exceptionally well. 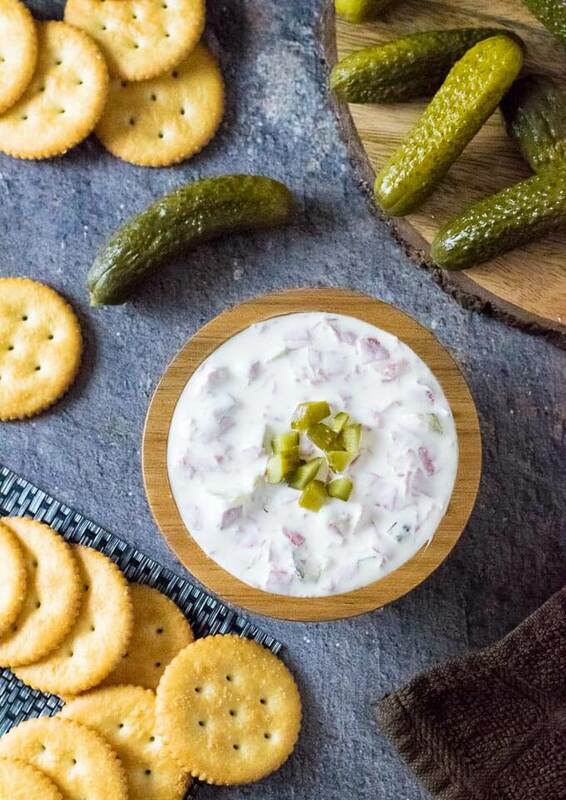 Traditionally wrapped pickles are coated in a blanket of cream cheese, however, cream cheese alone would create too stiff of a dip. Sour cream is added to soften the dip, making it easier to dredge crackers without breaking them. The pickle juice helps this as well, while also adding a lot of flavor. You can use your favorite crackers with pickle wrap dip, however, I think the buttery flavor of Ritz crackers works exceptionally well. There is no need to grab overly gourmet crackers for this dip. This is a great dip to make in advance of your party. The flavors will meld together better overnight and the dip will maintain the right consistency and texture for days. If you are serving this at a party there is no need to fuss with this at the last minute. If your guests love pickles as much as I do, serve it with my Dill Pickle Pasta Salad too! Soften cream cheese by letting the unopened packet rest in hot water for 10 minutes and then mix with sour cream, blending to ensure there are no lumps. 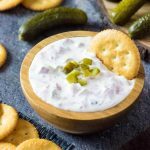 Dip can be served immediately with crackers or set in the refrigerator to allow flavors to meld overnight. *Deli ham can be substituted for the beef if desired. IF YOU LIKED THIS DIP you will also love my Homemade French Onion Dip. Is it Budding beef or Buddig as in the brand name? Buddig the brand, good catch.